Tingalpa, a residential suburb at the intersection of Wynnum and Manly Roads, is ten km in a direct line from central Brisbane. It is most probably named after Tingalpa Creek, five km eastwards where it enters Waterloo Bay at Thorneside. Tingalpa Creek was surveyed in 1841 and named Tingulpa, probably derived from an Aboriginal expression referring to a fat kangaroo. A Tingalpa township, on the west side of the creek where it is crossed by Old Cleveland Road, was surveyed in 1863. Known as Old Tingalpa, it was never built on and was formally abolished in 1948. New Tingalpa away to the north-west - just how the name travelled to there is unclear - was settled in the 1860s. An early inhabitant, Alexander Kelly, was a blacksmith, sugar planter and miller. A post office was opened in 1867 and the Gothic (Anglican) Christ church, designed by a local architect, Richard Suter, was built in 1868. (Situated in Wynnum Road, east of Bulimba Creek, the church and the burial ground are listed on the Queensland heritage register.) Two years later the Royal Mail (now Tingalpa) Hotel was licensed, and in 1873 a primary school was opened. All these facilities were generally around the Wynnum and Manly Roads corner, a location made even more prominent when a striking diggers' war memorial was constructed there in 1919. Meanwhile a Tingalpa local government division (1880) was established, some way distant. Its boundaries spread east and south-east from the intersection of the Pacific Highway and the Mount Gravatt-Capalaba Road, crossing the Tingalpa Creek and ending at Redland Bay. Its headquarters were at Mount Cotton. The part of the shire west of Tingalpa Creek was united with Greater Brisbane Council in 1925 and the balance was united with Cleveland Shire in 1949, becoming Redland Shire. In 1949 the Post Office directory indicated that, compared with 30 years before, there were fewer dairymen, but eight poultry farms, an indication that advancing suburbia was in need of a fresh egg supply. There were also two motor garages and the Pacific Cafe for wayfarers on Wynnum Road. 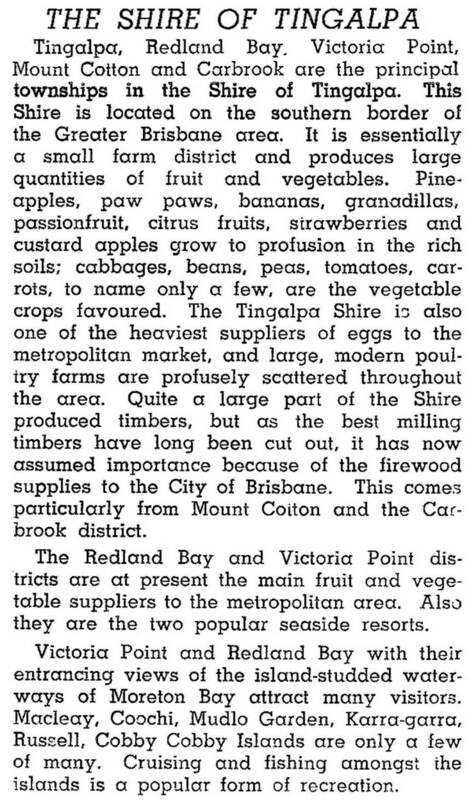 From nearly 1400 people in 1954 Tingalpa's population tripled by 1980. Its western edge is defined by Bulimba Creek and extensive linear parklands, and the settled edge is defined by the Gateway Motorway. There are other low-lying or wetland reserves, some tempting to land developers and drainage engineers. Two large spaces between Bulimba Creek and the Motorway have been for a polo ground and the Minnippi Parkland. Smiths Chips and the Murrarrie landfill have other sizeable areas. Kianawah Park, opposite the school, is the oldest reserve, with a number of facilities. Two small shopping centres are found near the diggers' memorial, and larger ones are west at Cannon Hill and south in Belmont. Tingalpa also runs east along Manly Road as far as Manly West and the Moreton Bay College.